In the US we have recently begun to see a new slew of mobile-based applications pop up, those that claim to help control spending, deposit checks virtually, even replace traditional bank accounts. The idea of getting rid of your brick-and-mortar bank may seem revolutionary here, but even more astonishing is that in countries such as Kenya and Ghana, citizens are already using their mobile phones for banking services, even without access to well-developed smartphone apps. It is estimated that up to 50% of the world’s adults are unbanked, unable to open traditional bank accounts due to a lack of access, or because banks do not see them as valuable customers. As a solution they have turned to mobile money, an industry which is quickly sweeping the developing world. By using basic text message technology these users are for the first time able to save money, withdraw cash from agents, and make transfers. Across all markets, youth respondents made up the majority of our sample. The pilot sample was as follows: Ghana n=102, Nigeria n=100, Uganda n=125. The chart below describes the age distribution of all survey respondents by country. Mobile money awareness is very high in Ghana compared to Nigeria and relatively high compared to Uganda. Mobile Money awareness among Nigerian respondents is at 58% and 82% among respondents in Uganda. Additionally, more respondents from Uganda (71%) reported being aware of some merchants who accept mobile payments in their area. Merchants’ awareness among our survey respondents in Ghana is at 61% and 37% in Nigeria. 61% of Survey respondents in Uganda reported having to travel less than 1 kilometer in order to reach a Mobile Money agent, while only 38% reported traveling the same distance to access a financial institution. In Ghana and Nigeria, having access to a Mobile Money agent or a financial institution is similar within 1 kilometer of respondents’ location. It is interesting to see that 89% of Nigerian respondents perceive Mobile Money as a “very helpful” service, while its awareness and use are very low compared to other markets. 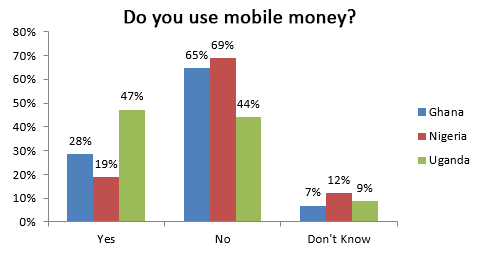 79% of respondents in Ghana and 88% in Uganda think that Mobile Money is very helpful. The same goes with satisfaction which is higher in Nigeria (84% of respondents who use Mobile Money are very satisfied), while it is at 76% in Ghana and 61% in Uganda. In addition to being satisfied with their Mobile Money provider, 89% of Nigerian respondents are very likely to recommend their Mobile Money provider to friends and family. One surprising result was that in Ghana, 79% of respondents who use their mobile device to perform financial transactions also have or share a bank account at a financial institution, and similarly survey data shows that 63% of Mobile Money users are banked in Nigeria. In Uganda, where Mobile Money awareness and use is higher, only 36% of individuals surveyed indicated having a bank account. Technology is a key factor to including more people in the financial ecosystem, especially in the developing world. Mobile phones are leapfrogging many hurdles to financial access by allowing subscribers to perform essential financial transactions using their cell phone at any time, and we are excited to learn more as mobile money evolves and becomes more prevalent.